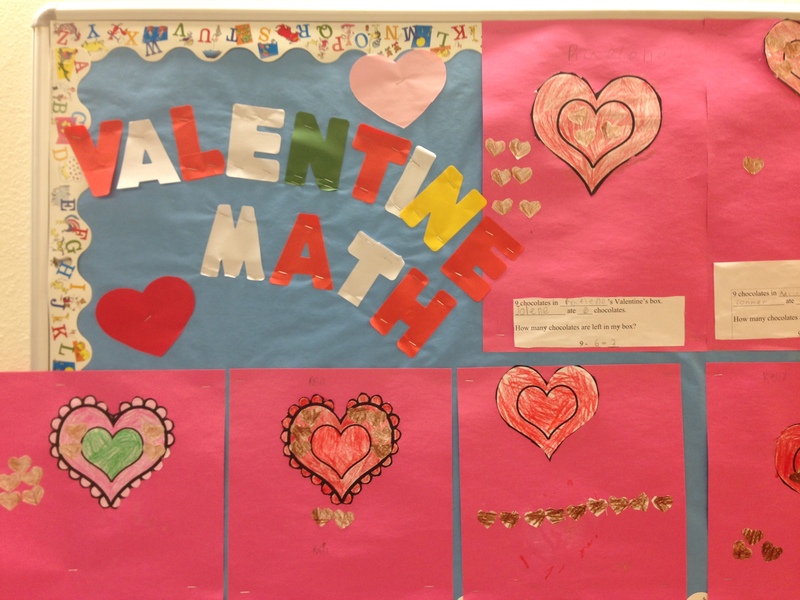 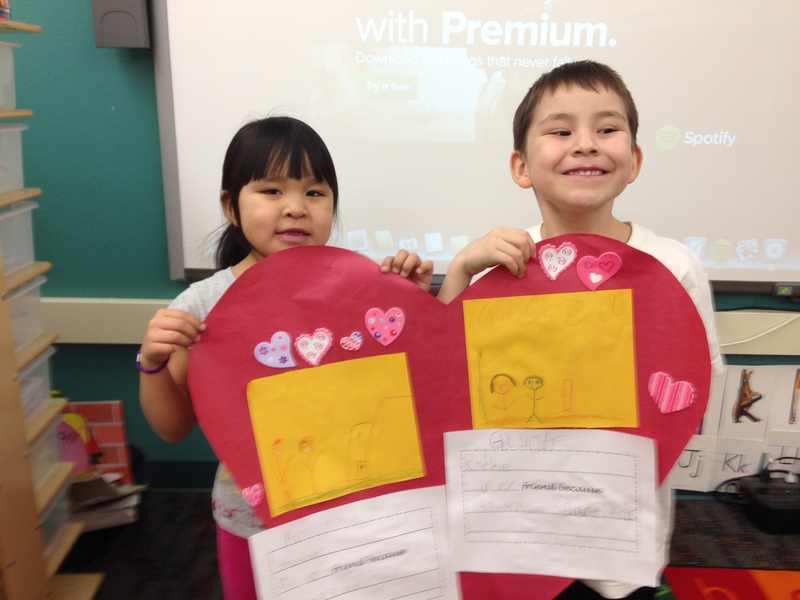 What a busy and fun few days we had for Valentine’s this year! 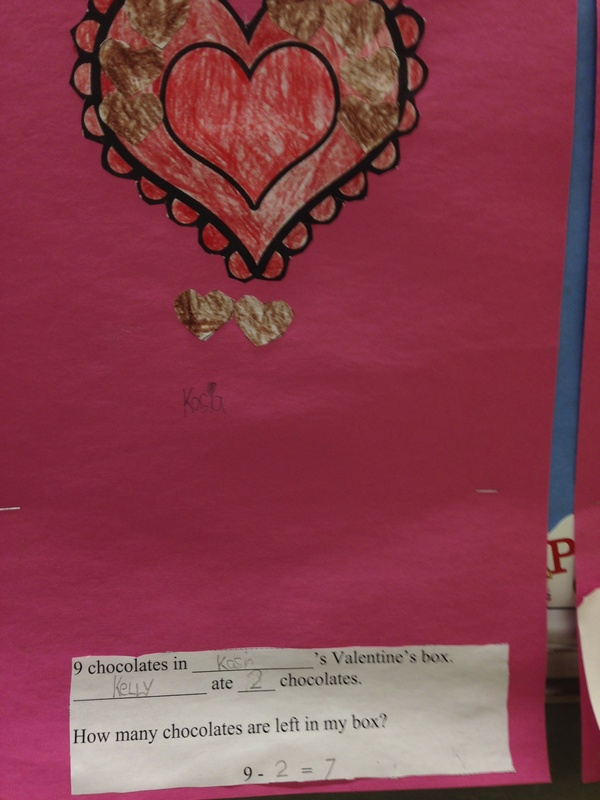 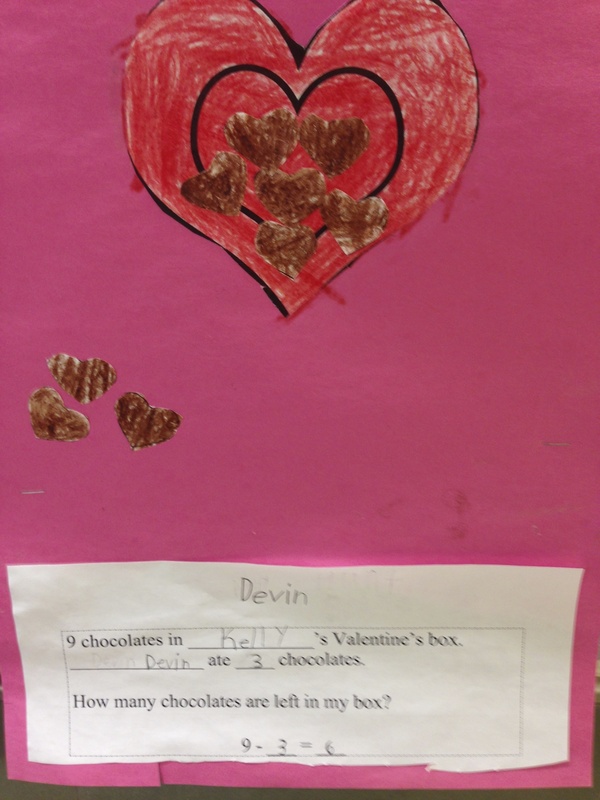 We started off by making subtraction stories about chocolate candies. 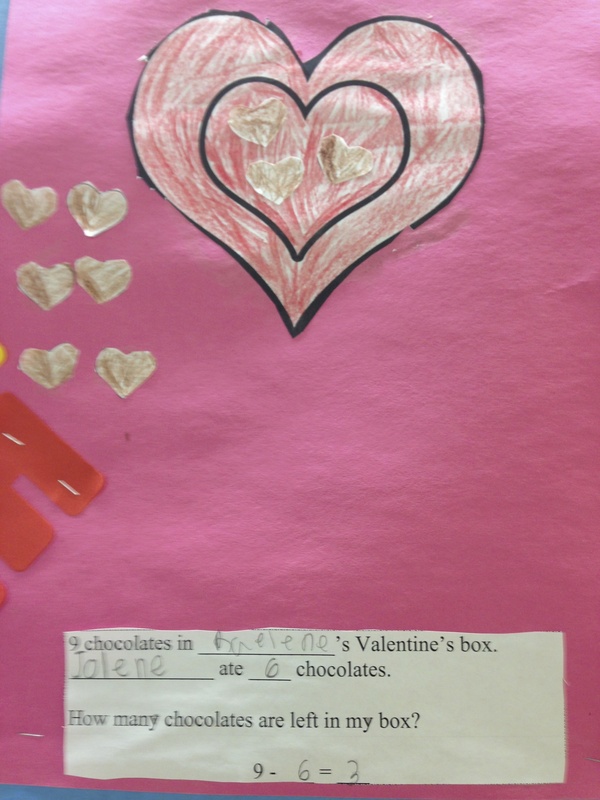 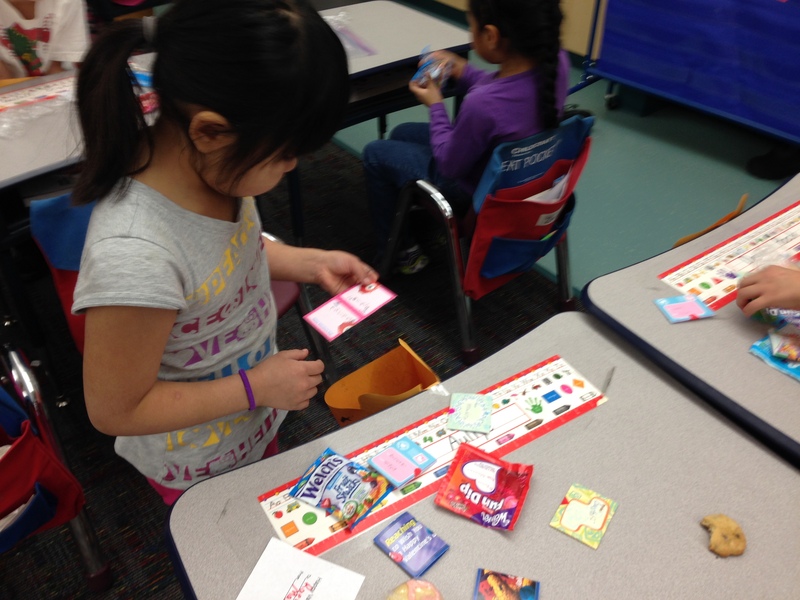 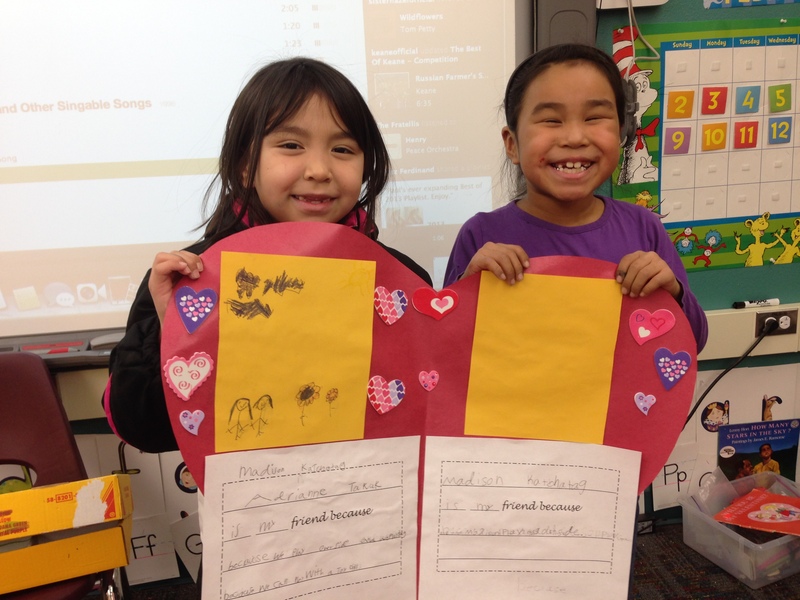 Then for our Valentine’s Day party we decorated envelopes for our friends to put Valentines in, passed out Valentines cards, had snacks, and made Valentines with our friends and wrote why they were our friends. 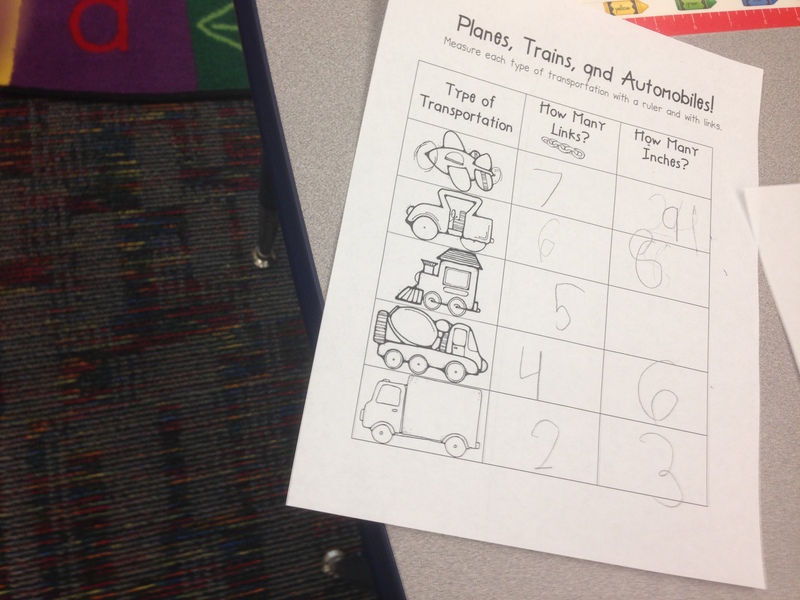 As we continue with our 2nd week on our transportation unit students had a chance to practice the skill of activating their prior knowledge. 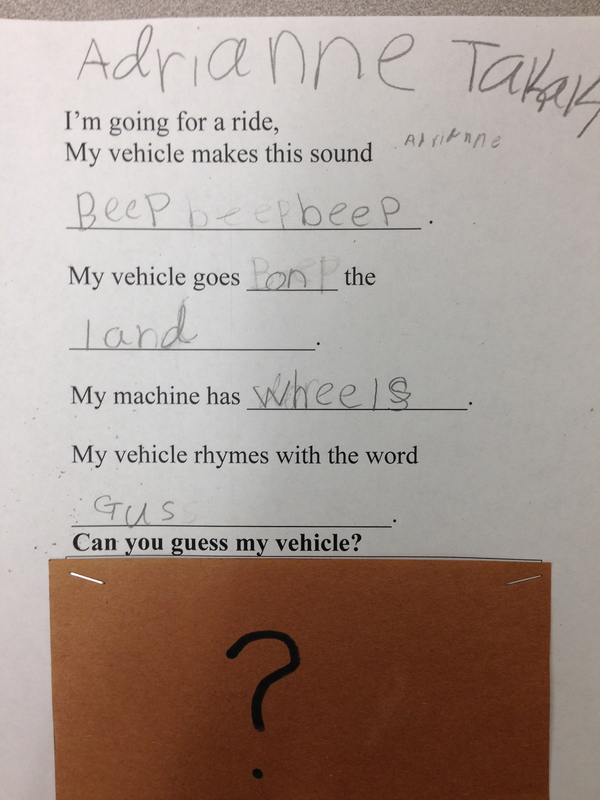 We watched the Sesame Street video and listened to the song “I’m Going for a Ride“. 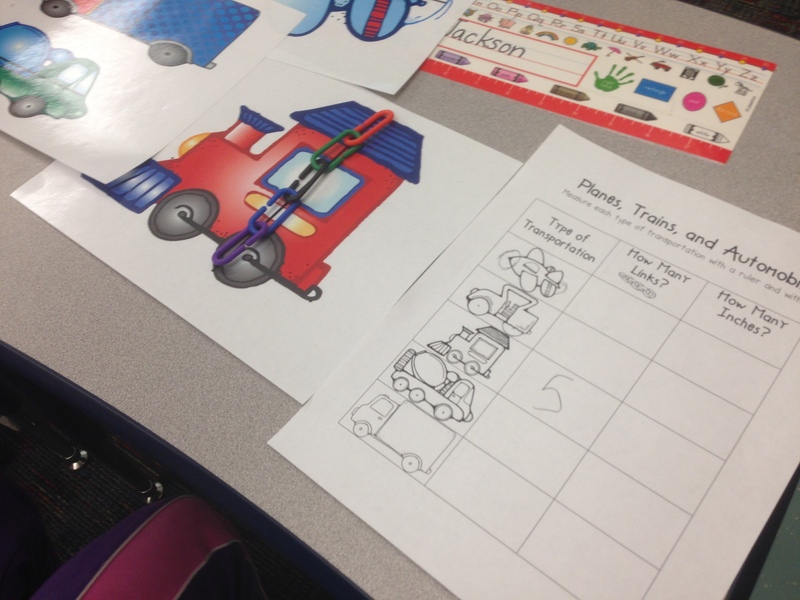 Students were given the opportunity to guess what mode of transportation of each character was going to ride on by activating their prior knowledge. 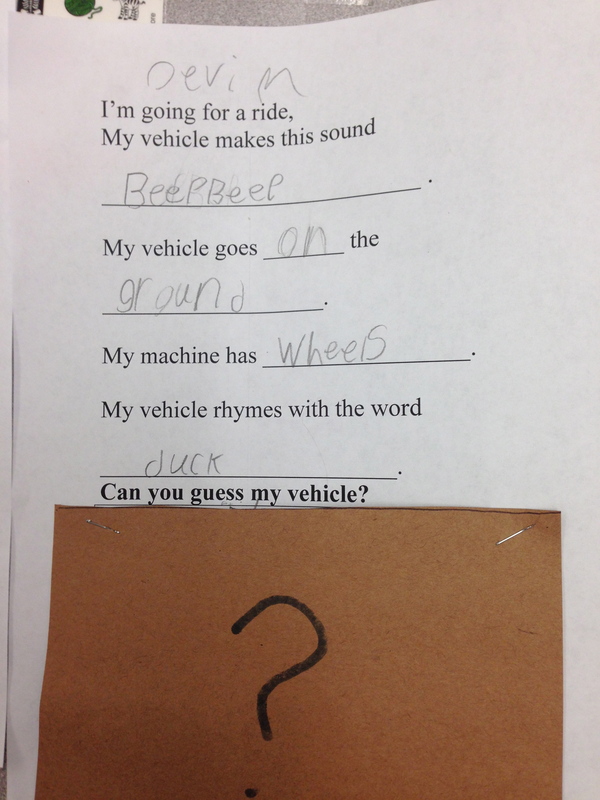 Then students got to play their own game of “I’m Going for a Ride” writing about the mode of transportation they chose without showing the answer. 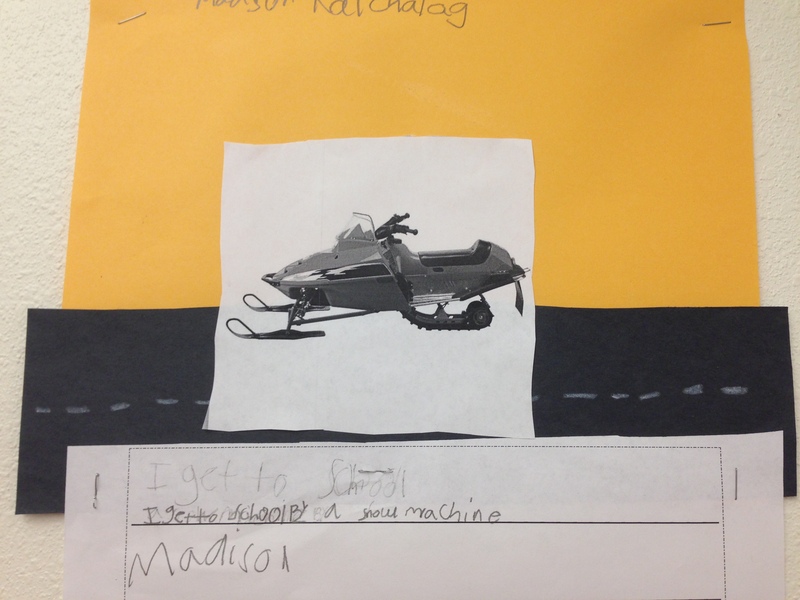 After students completed their writing, the class paired up and read their partners writing and guessed what their friends mode of transportation was. 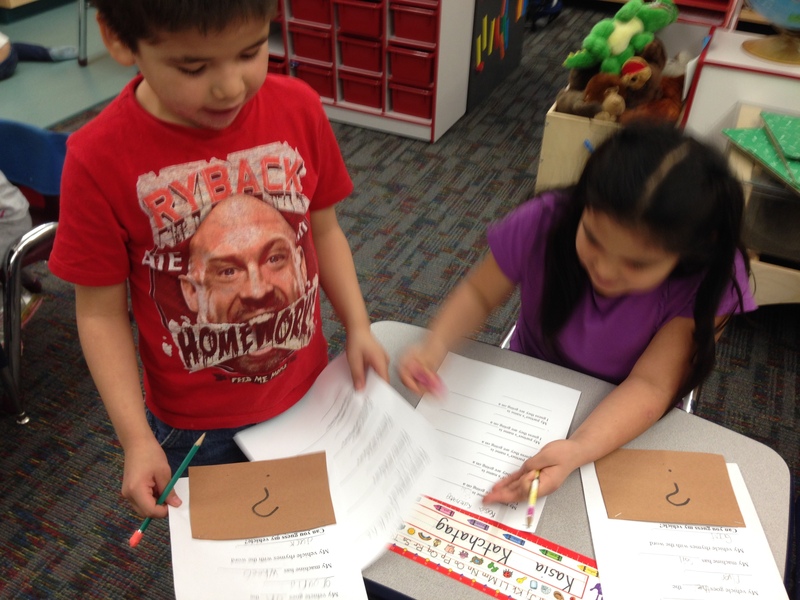 After each pair was finished, the groups rotated until everyone had a chance to guess each other’s. 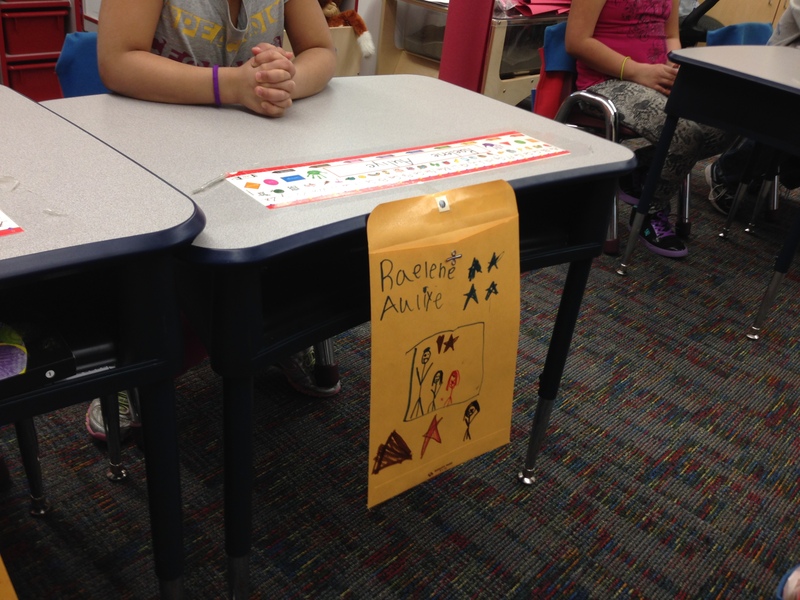 Finally at the end of the activities students revealed what mode of transportation was theirs and we posted up so others could read and have a chance to play our “I’m Going for a Ride” game! 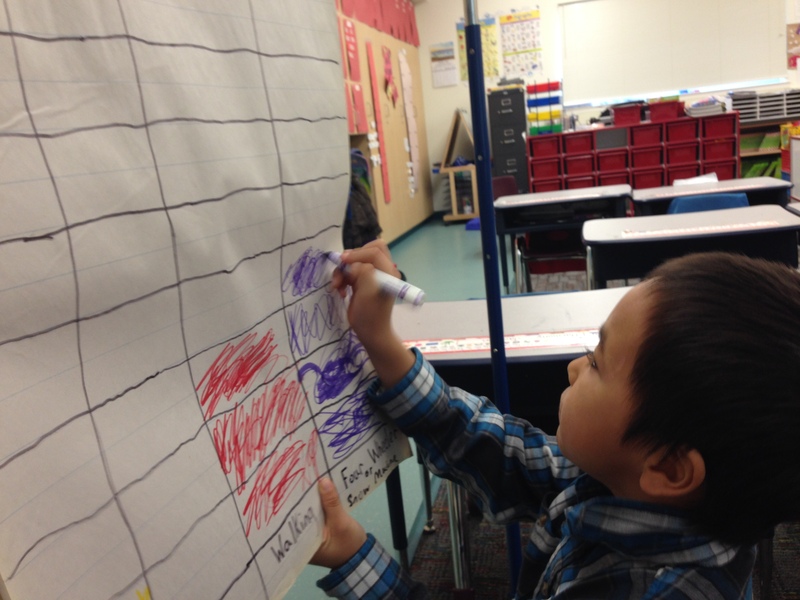 We have been learning quite a bit in math this past month! 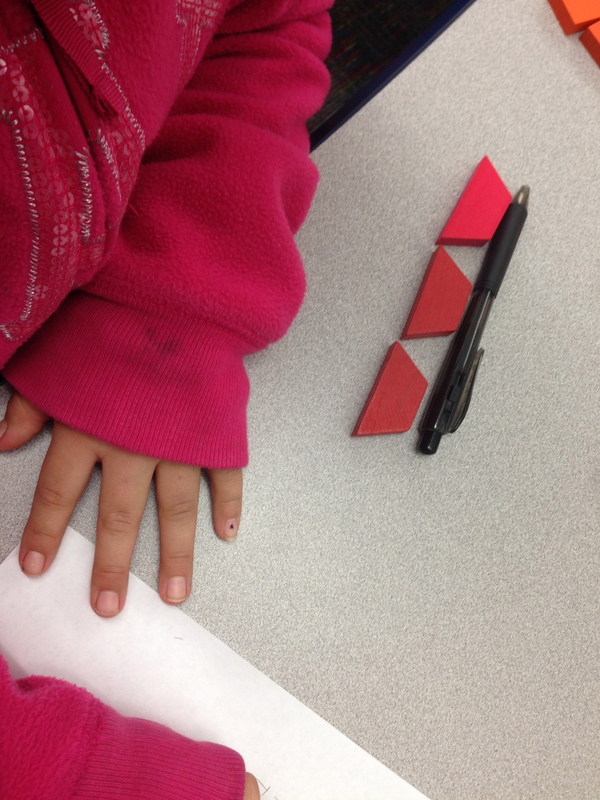 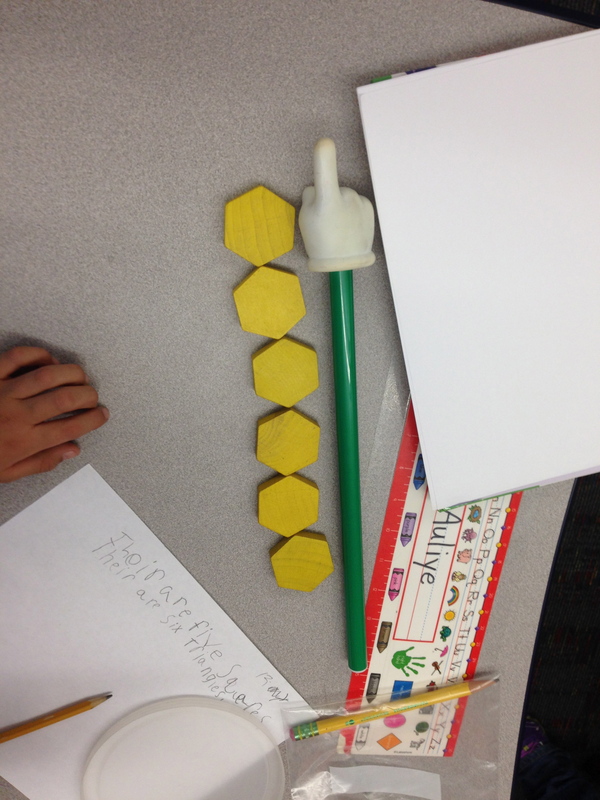 In Kindergarten we’ve been learning how to measure using standard / non-standard units. 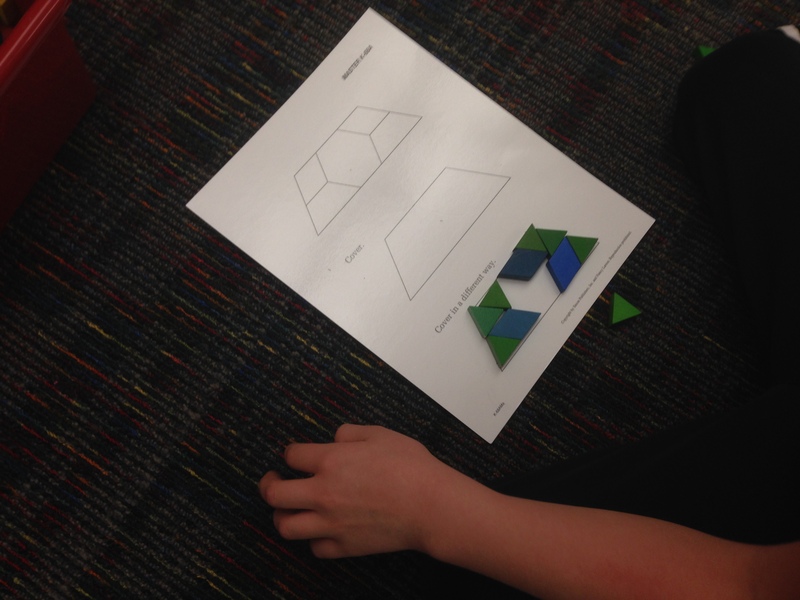 First grade we have been working on Geometry learning about symmetry, congruence, and making bigger shapes using smaller shapes. 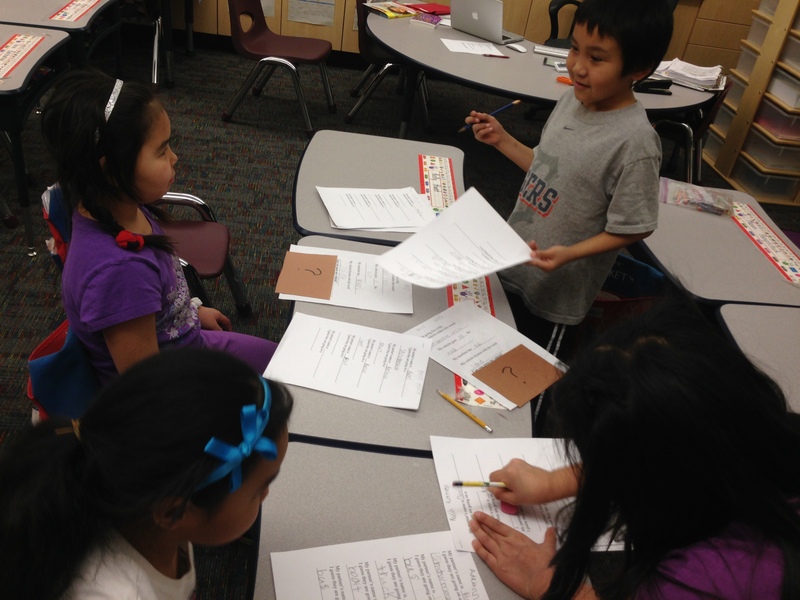 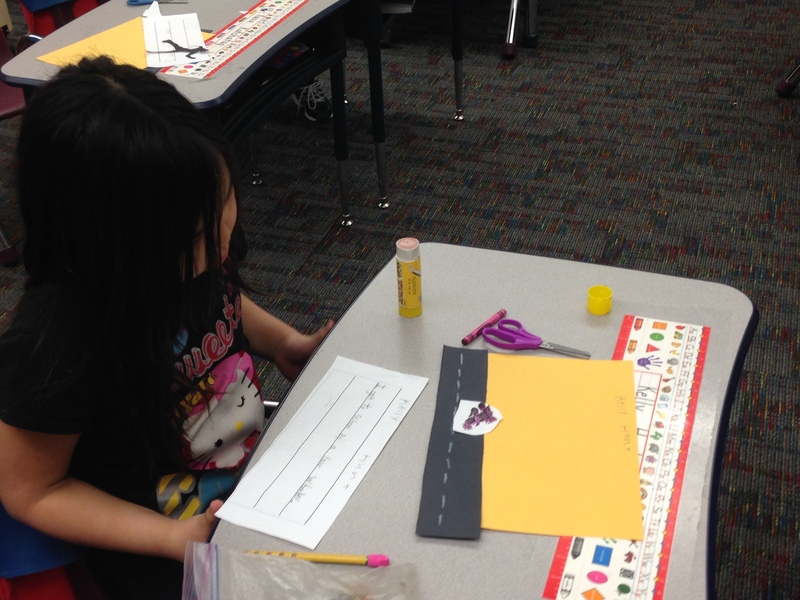 As a spiral review our K-1 All-Stars have also been completing centers reviewing their addition and subtraction facts. 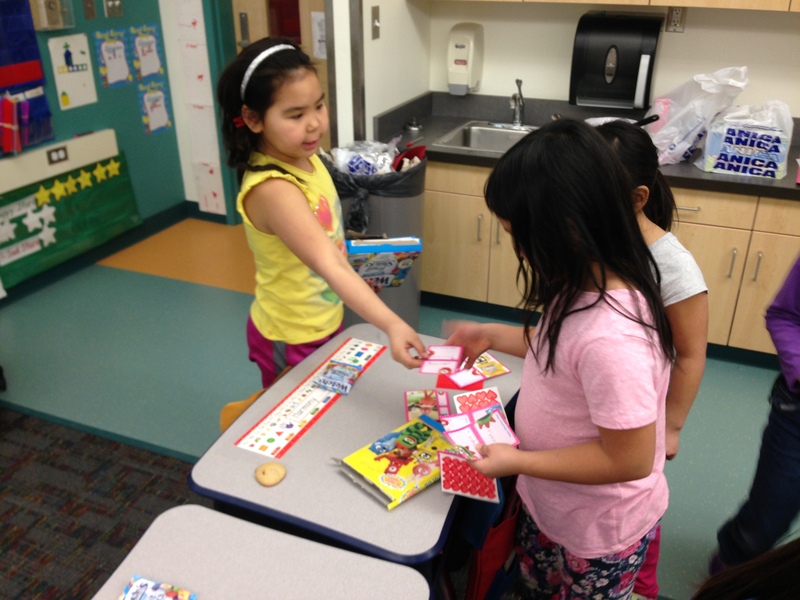 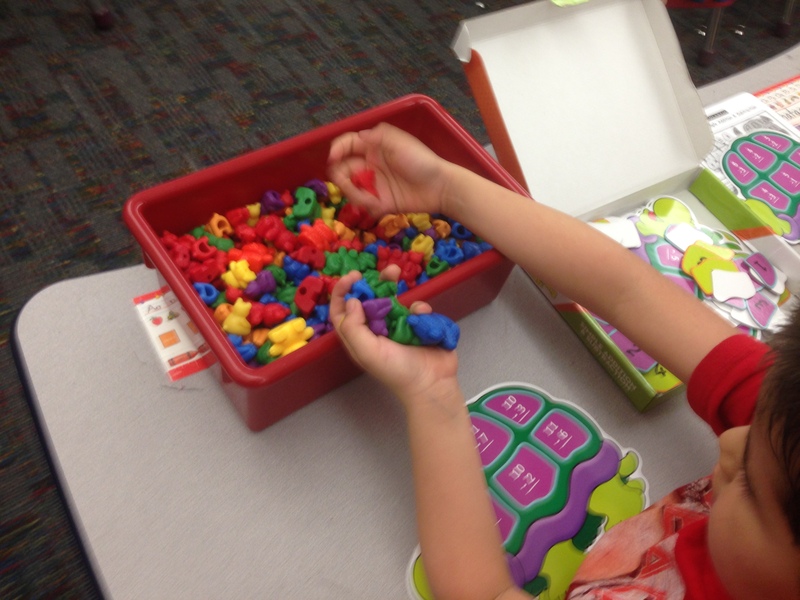 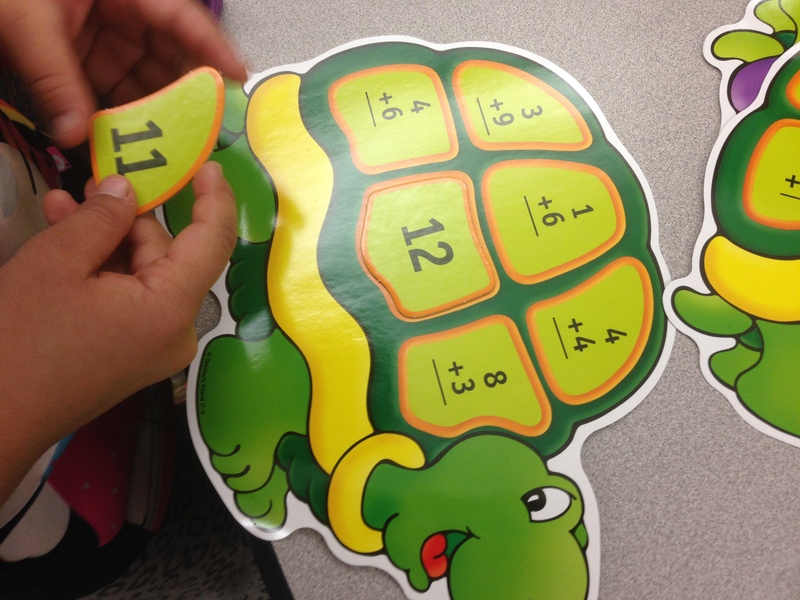 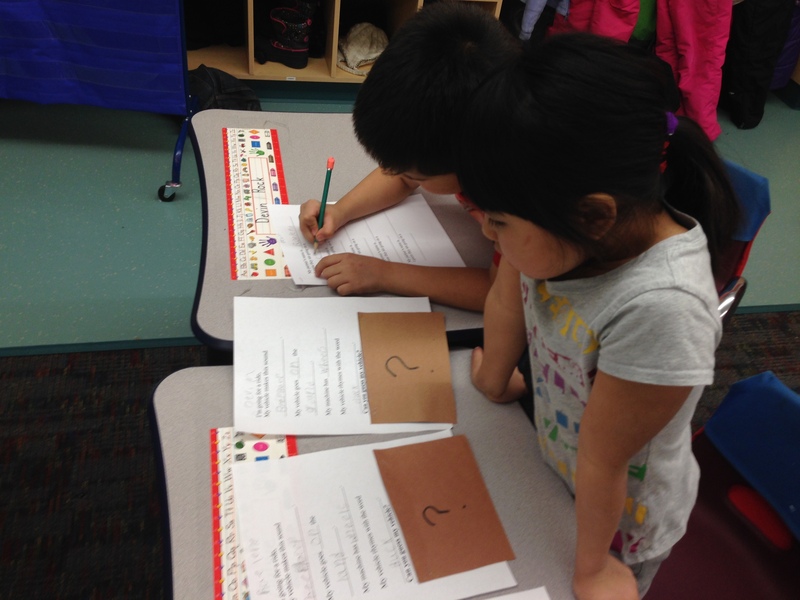 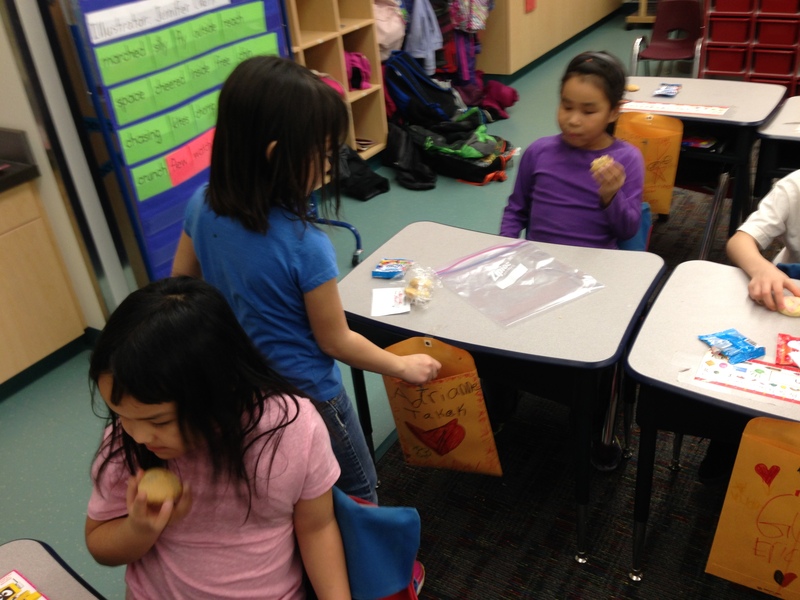 Kindergarteners were allowed to use counting bears to help them with the concepts. 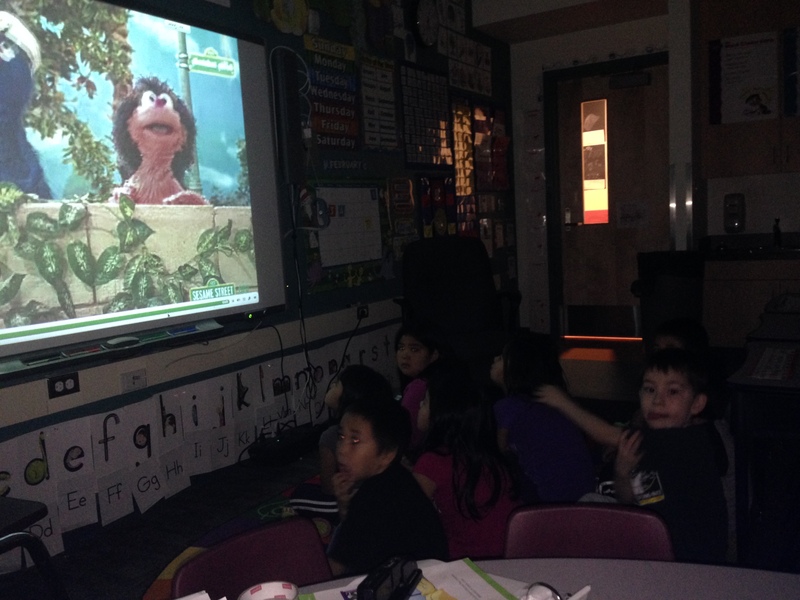 Continuing with our Transportation unit, we watched a movie from Sesame Street on how children in Egypt get to school. 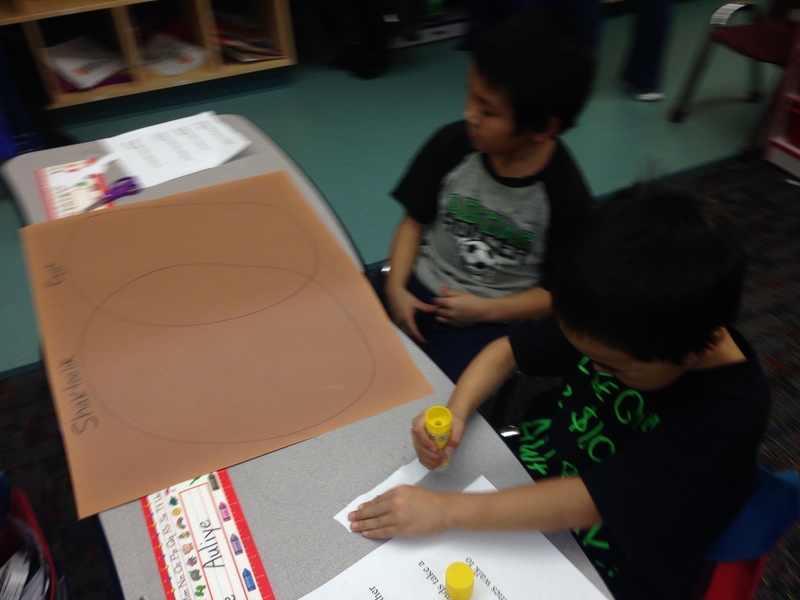 We discussed the main ideas and details from the video. 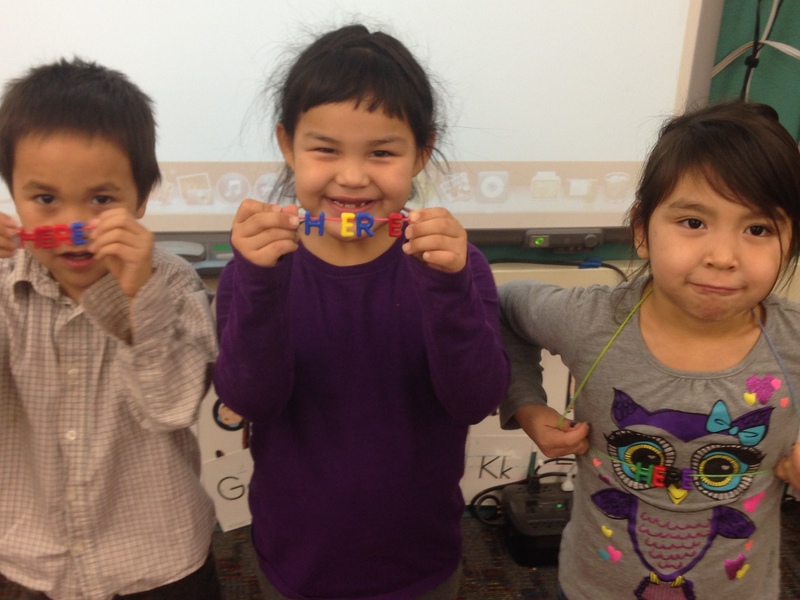 Then after the video we reviewed the ways we get to school and compared them with the ways we go to school up here in Shaktoolik, AK. 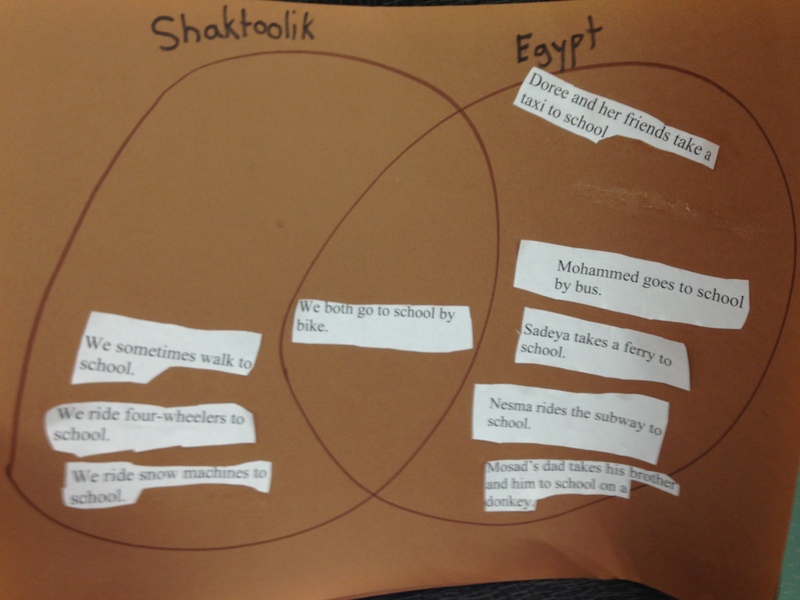 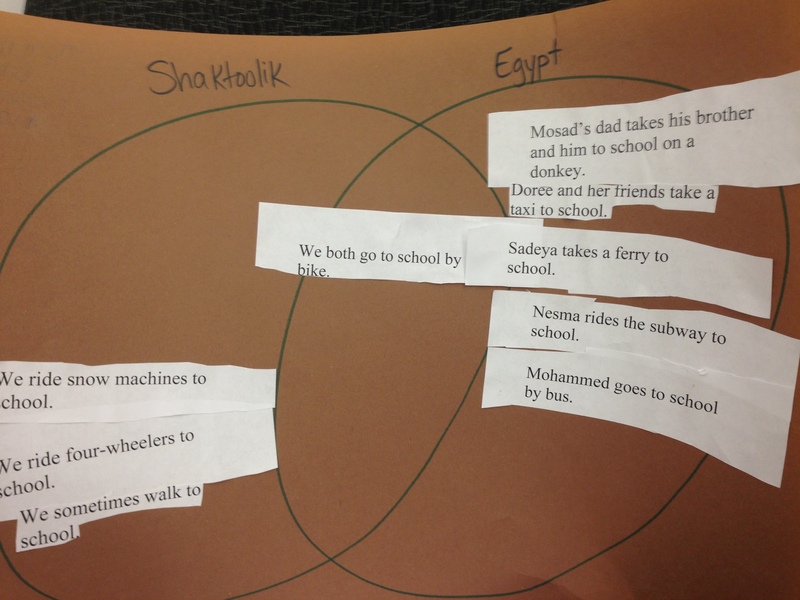 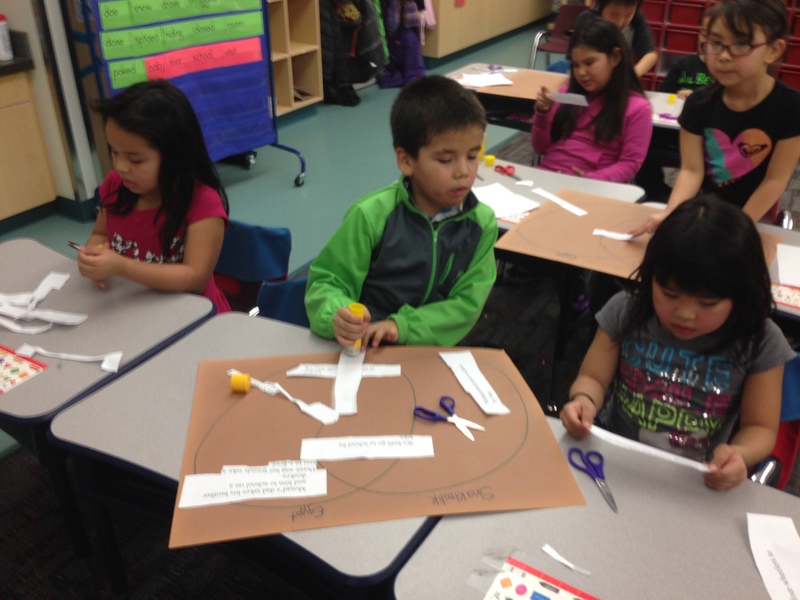 Students got into groups of 2 and created a cut and paste venn-diagram. 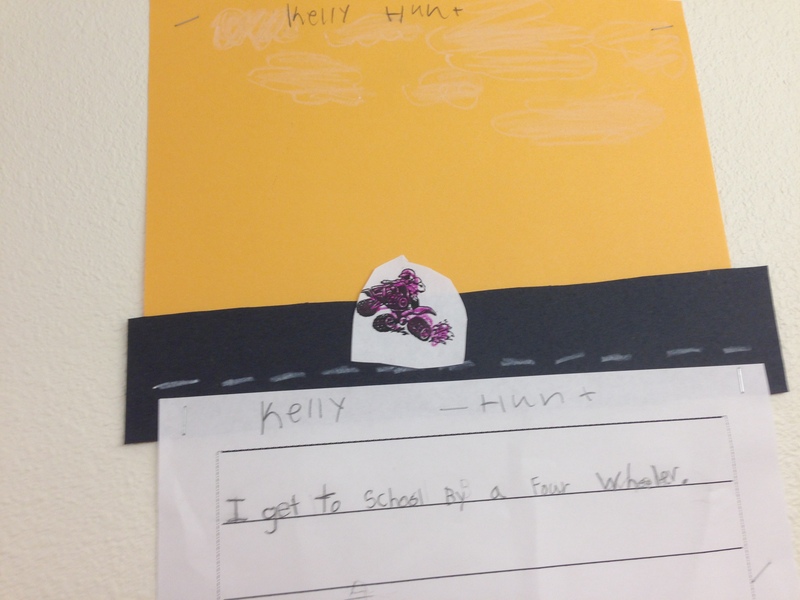 We began our new unit on transportation this week and we started it off with a book as a song called, “We All Go Traveling By“. 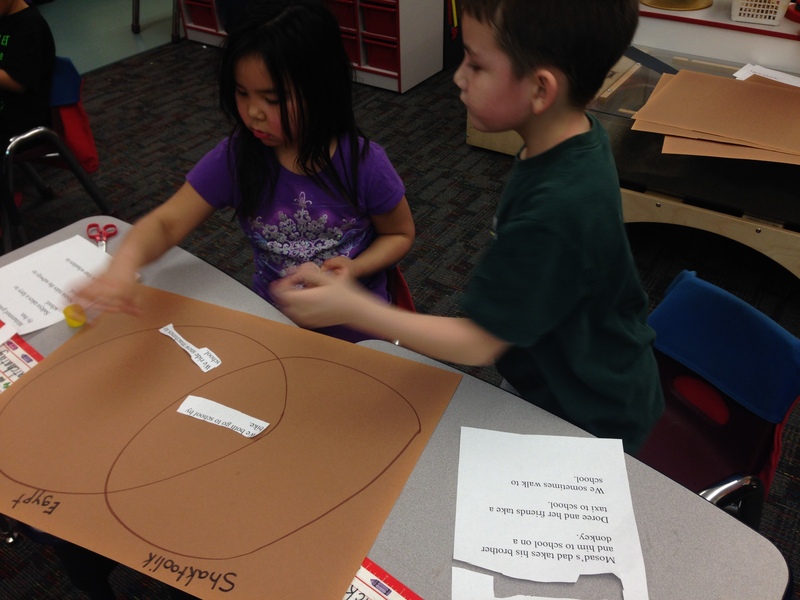 We then created a bubble story map and filled out the main idea and details of the story. 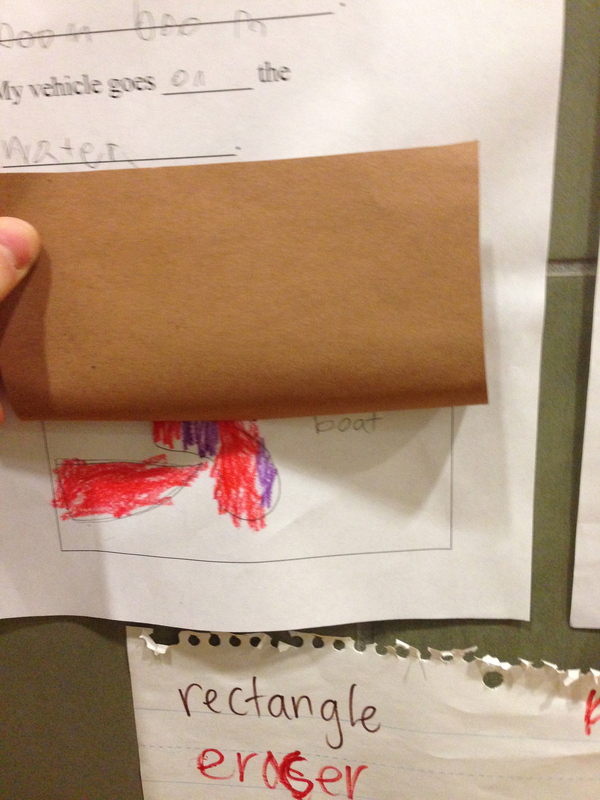 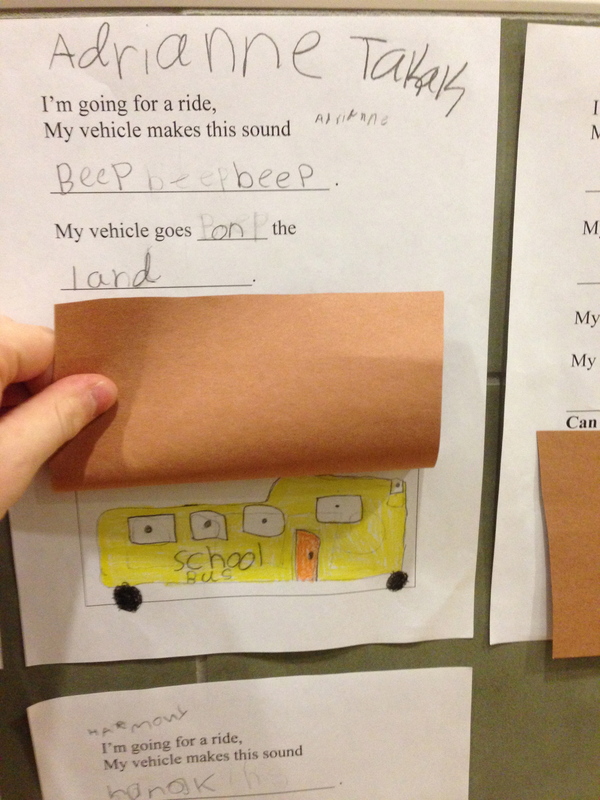 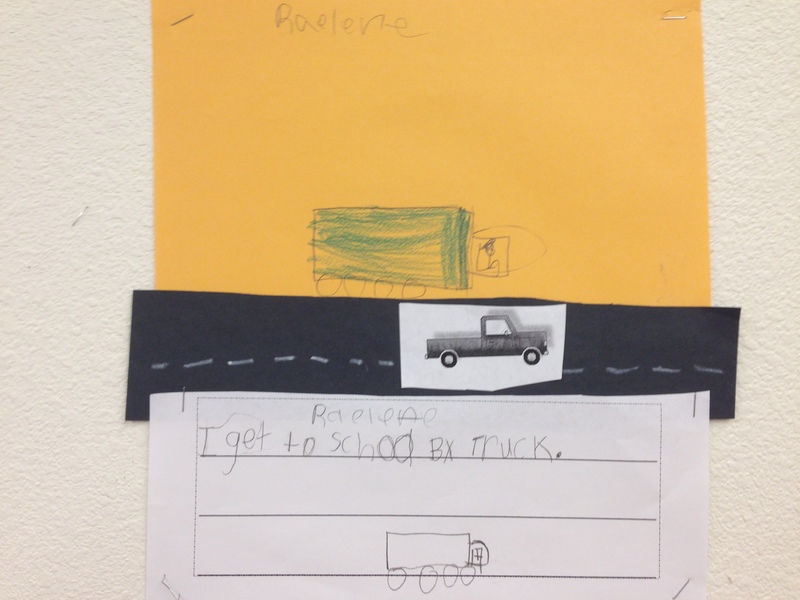 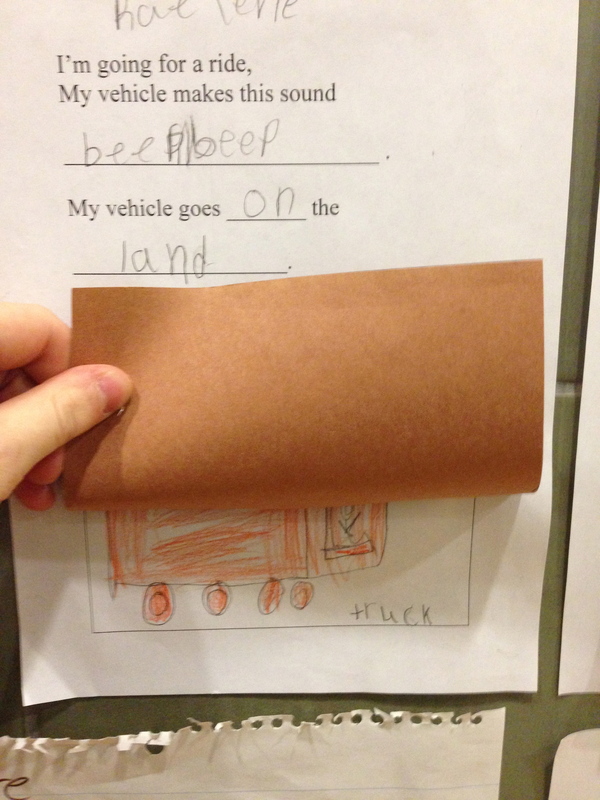 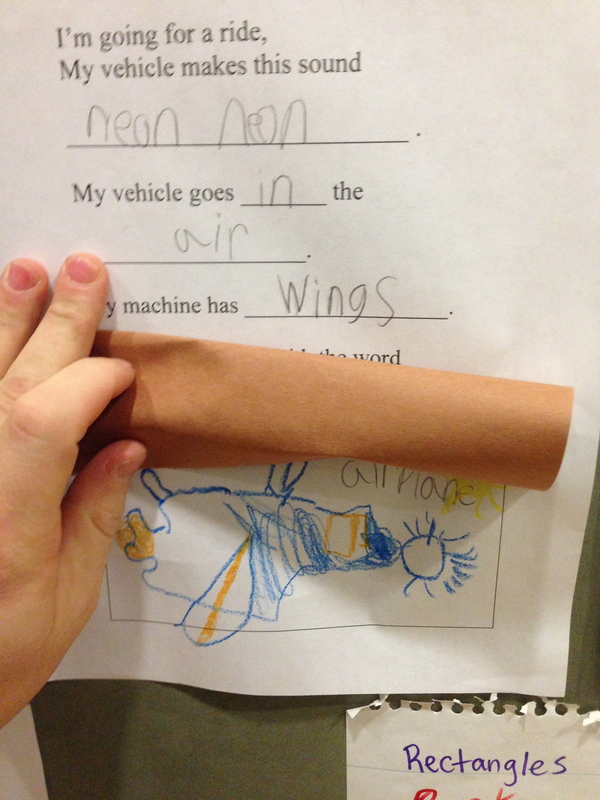 Students helped recall the modes of transportation were featured in the story and the sounds they make. 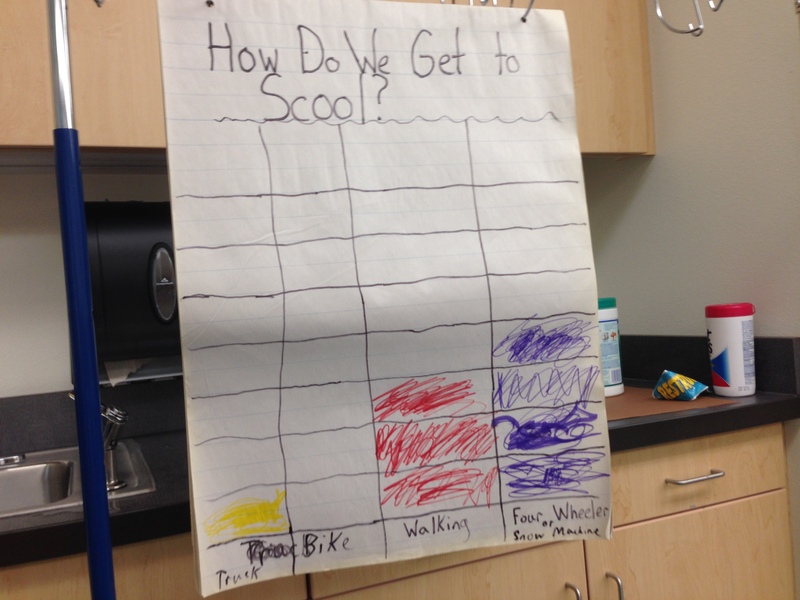 At the end of the story everyone ended up at school so we created a bar graph of the ways that we get to school in Shaktoolik. 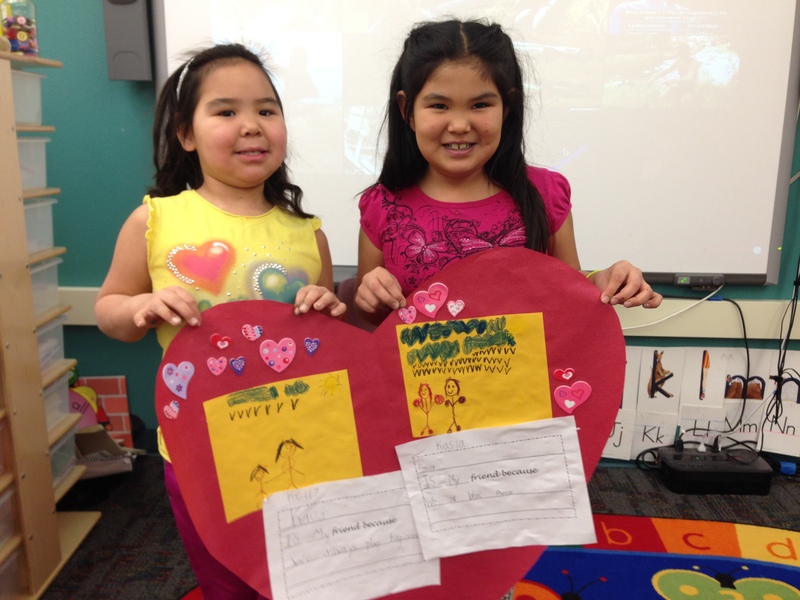 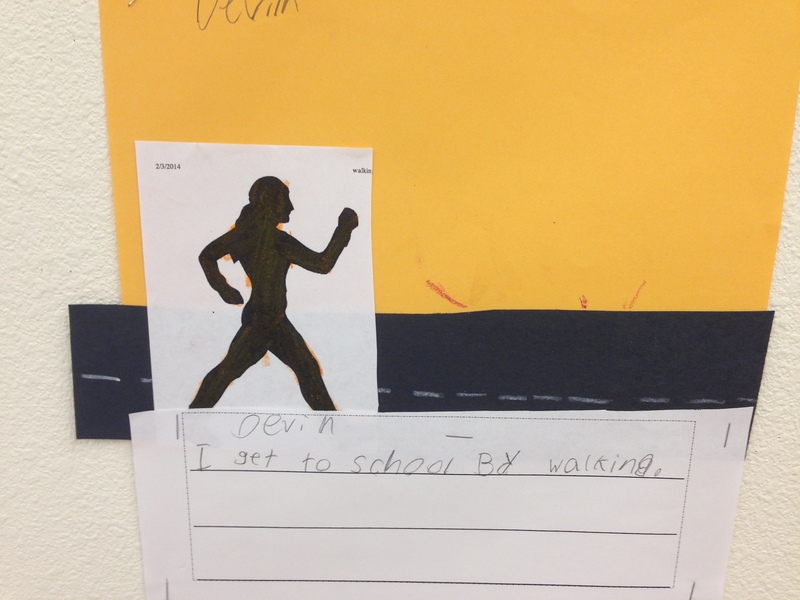 Then we wrote about how we got to school and created cutouts and illustrations. 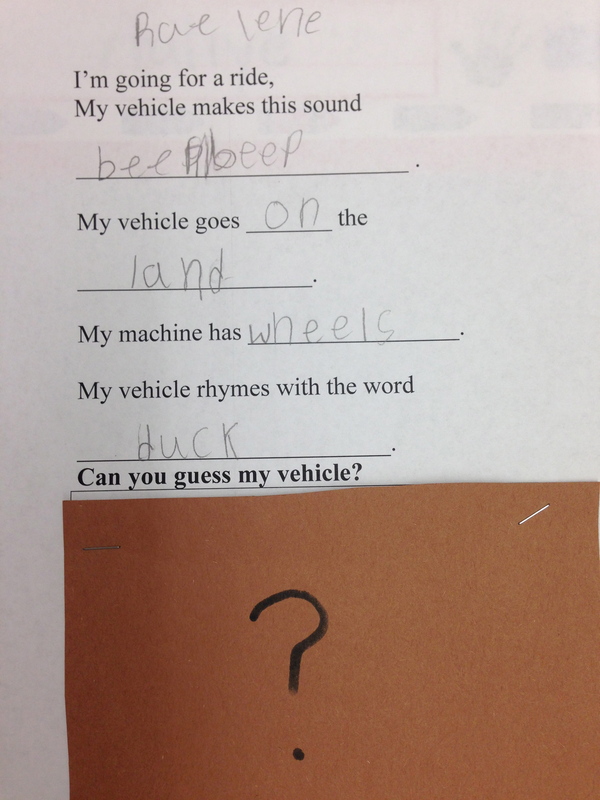 Sight words have been a huge focus during literacy workshop this year. 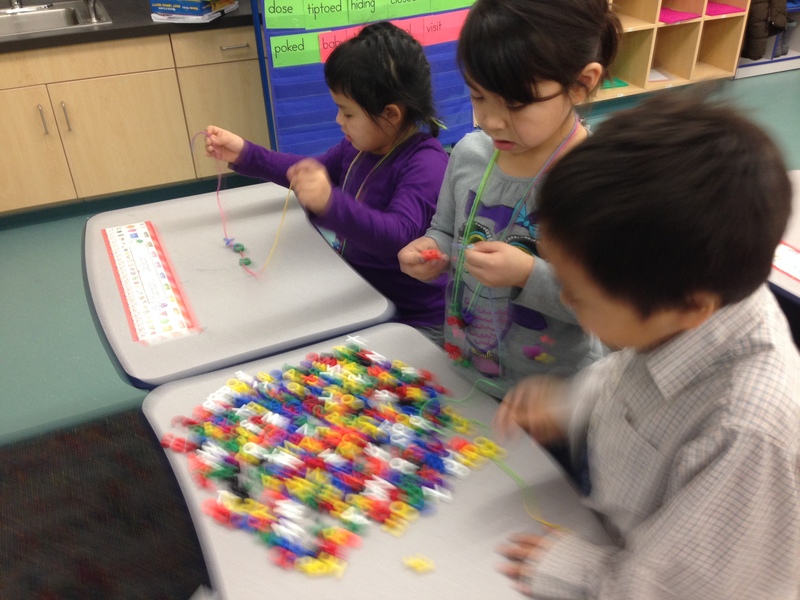 We have been looking for more ways to make sight words more fun and interactive and I found letter beads. 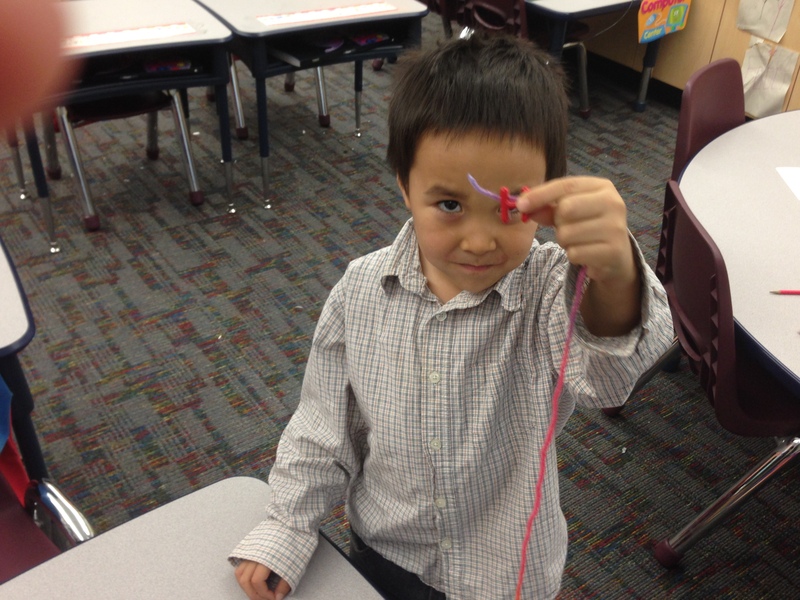 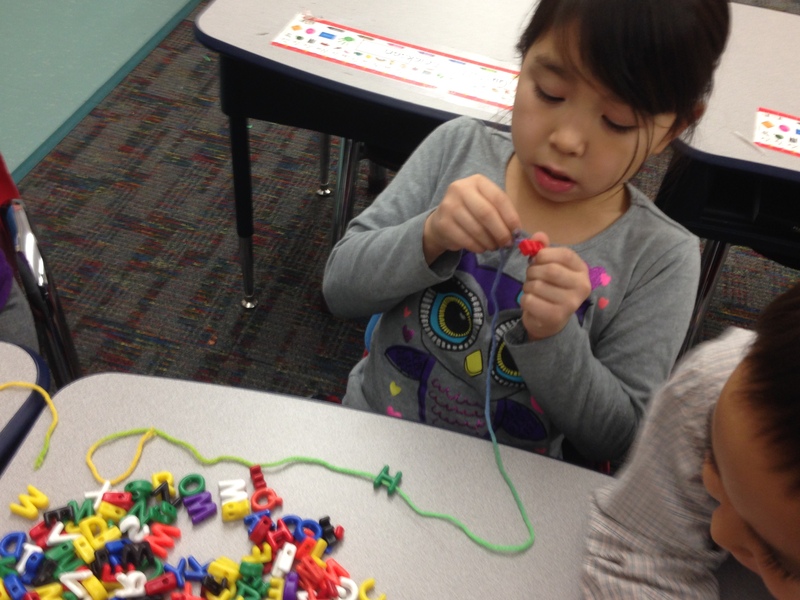 So as a center, Kindergarteners got to create their own sight work necklaces during their workshop time! 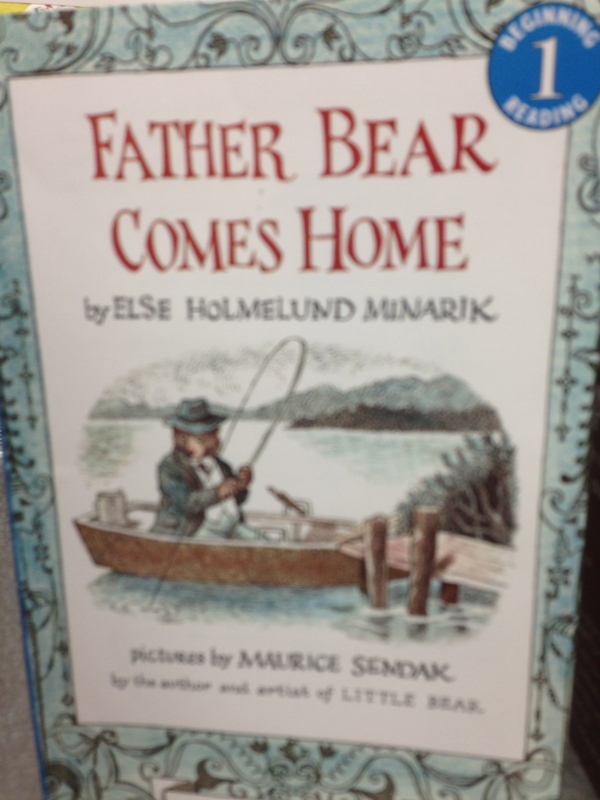 For our daily story tree read-aloud we finished reading the beginner chapter book “Father Bear Comes Home”. 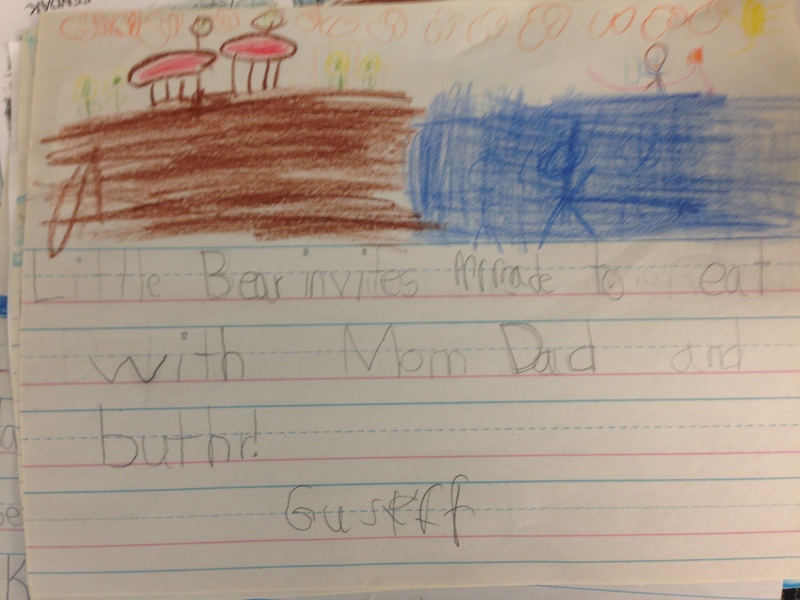 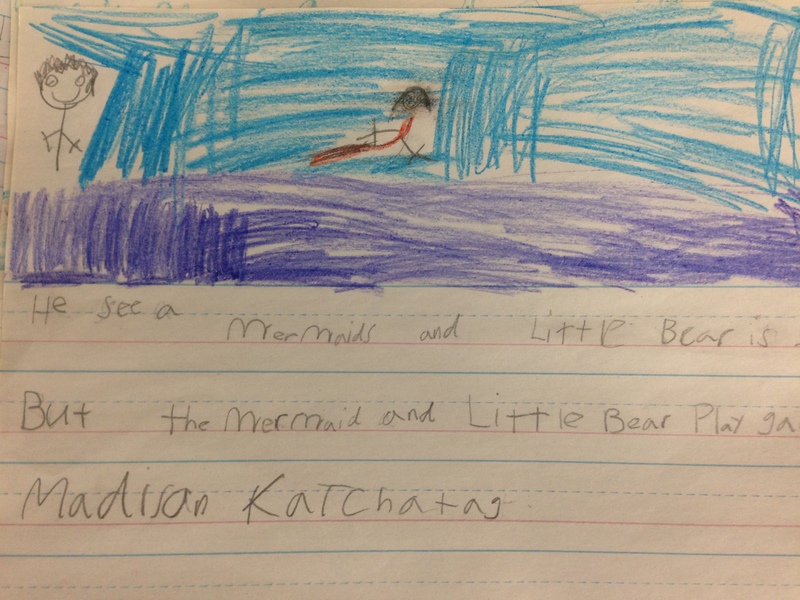 The story ended with a “cliff-hanger” where baby bear dived into the river in search for a mermaid. 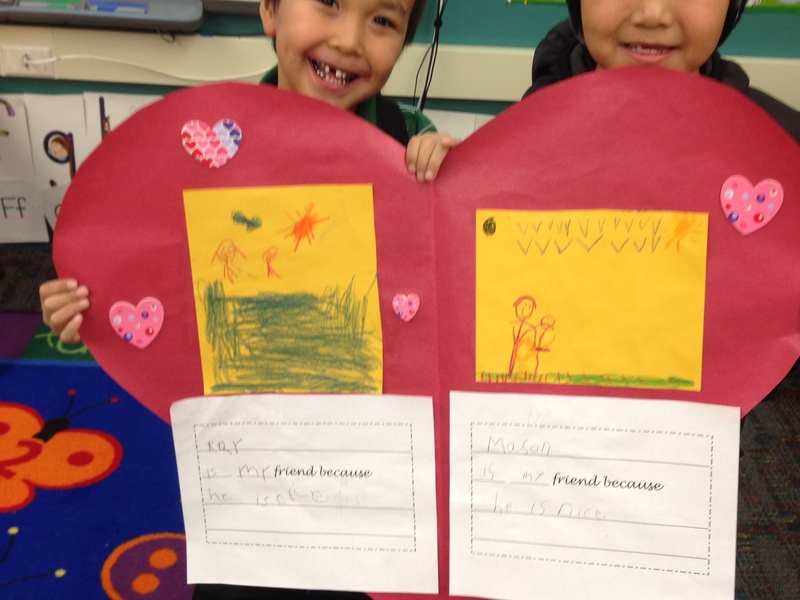 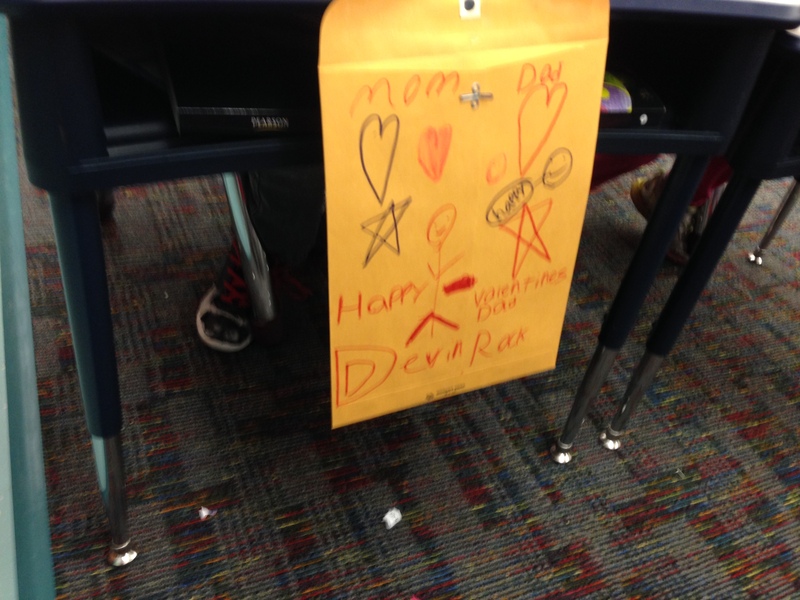 For writing as a class we discussed what makes a good ending to a story. 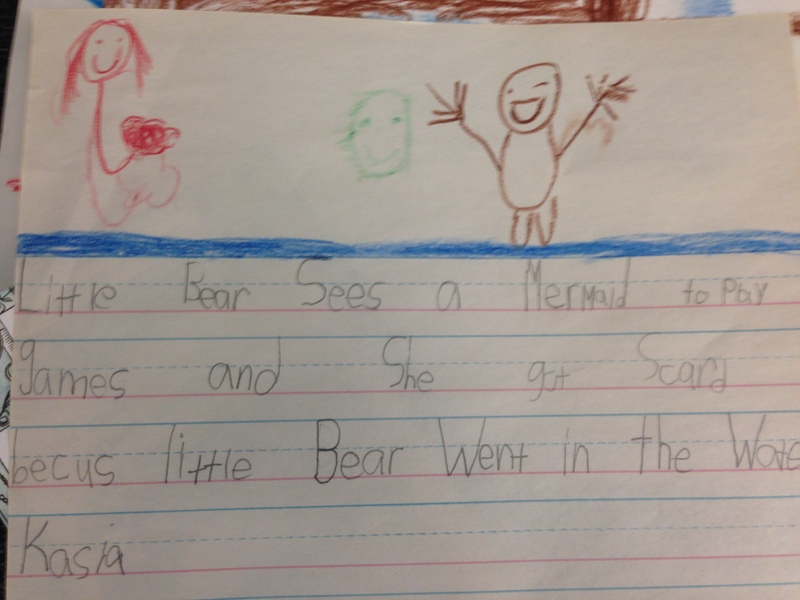 Student’s then wrote their own endings to the story.